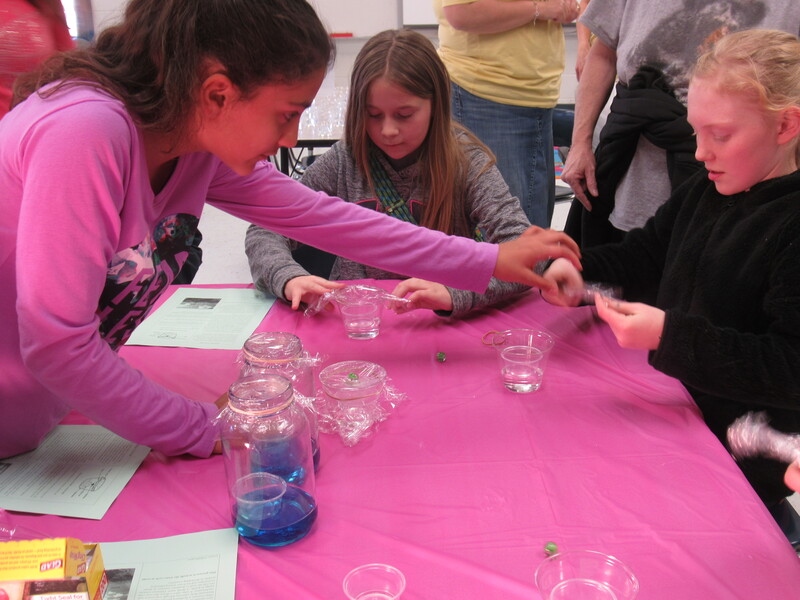 Hazelwood Elementary School’s Third Annual Family STEM Night was held recently. This fun night was a way for parents to connect with their children’s education. Parents and students from all grade levels stopped by interactive booths positioned around the school to learn about the practical applications of STEM. STEM Education is an infusion of Science, Technology, Engineering, and Mathematics through project-based learning to understand complex problems and to prepare students to be the next generation of innovators. The Kindergarten team helped students create a parachute which involved the study of force/motion, engineering, and measurement. The 1st grade team also focused on measurement and force/motion by having students create a slingshot with a pompom and dixie cup. Students got to experiment with sound and create an old fashioned telephone with the 2nd grade team. The 4th grade team created an engineering challenge for students to tackle. They tried to build a structure with marshmallows and toothpicks that would be structurally sound enough to withstand an earthquake. The 5th grade team helped students create a solar still to explore the weather cycles on Earth, the water cycle, and how impure water can be changed into pure water. Tuscola’s STEM Club came to STEM Night as well and set up 8 different stations in the cafeteria. Students were wowed by THS students changing solid materials using chemical reactions and by learning how acids can be separated by making their own milk of magnesia. One last station had students comprehending the life cycle of a butterfly by making a yummy snack. Each part of the snack represented a step in the life cycle. All eight of Haywood County Schools’ elementary schools follow the STEMscopes curriculum, which is aligned with the N.C. Essential Standards for Science. STEMscopes is based on hands-on, inquiry-based investigation that helps students become tomorrow’s STEM leaders and innovators. This approach allows students to experience science. As students dive into the investigations found in each scope, they develop their own contexts and meanings for the scientific concepts they are learning, retain more knowledge, and develop deeper understandings of the world around them. What makes STEM stand out from traditional science lessons, Rogers said, is a focus on problem solving and student-led projects. Projects are connected to lessons students are currently learning about. STEM Education is one strategy that North Carolina is utilizing to increase high school graduation rates and encourage postsecondary education. The goal of the STEM system is for students to enter high-skill, high-wage, and high-demand careers. The N.C. Department of Public Instruction states that STEM Education is a key economic driver in the state. It touts STEM Education as an economic imperative to transform education, build a world-class workforce, align with emerging industries, and ensure N.C. economic prosperity. We, at Hazelwood Elementary School, also agree with this direction and focus for our students. We will continue to integrate STEM during our school-day and for parent-involvement events all year long.